Without an agreement, the company’s lenders, HSBC and Barclays, could demand repayment of debts that may amount to nearly £10m, potentially forcing Patisserie Valerie to call in administrators. Other options include a second bailout by Johnson, the multimillionaire chairman of the business, who pumped £20m of his money into Patisserie Valerie to keep it afloat after the company uncovered “potentially fraudulent” accounting irregularities and a financial black hole in October. 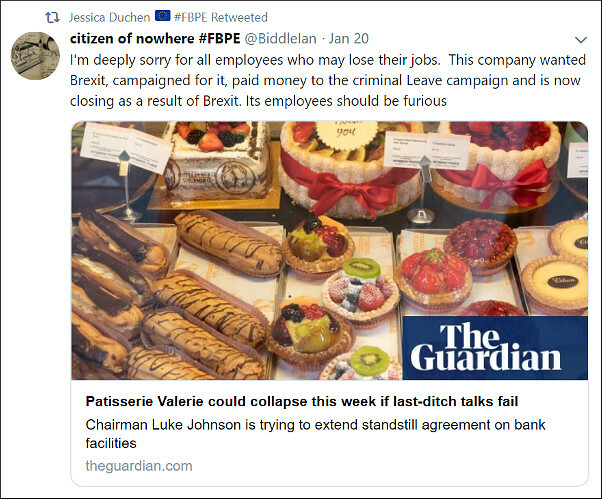 As is clearly explained in the article, accounting irregularities and not Brexit are responsible for Patisserie Valerie's financial predicament. I voted 'remain' in the referendum. But I believe the hysterical nonsense being indiscriminately peddled by vocal 'remainers' is seriously undermining the many valid arguments of the 'remain' movement. On Brexit Ms Duchen seems mentally unhinged. People like Howard Goodall and her should stick to things they know something about.